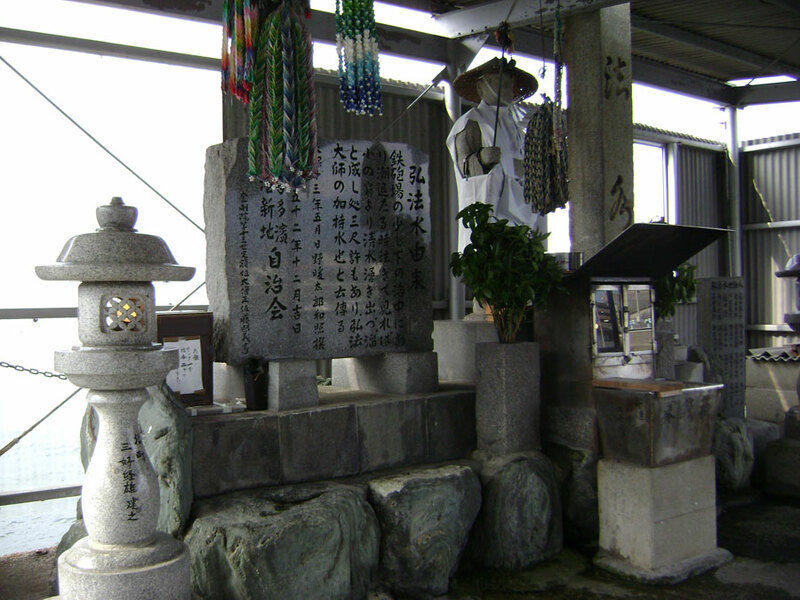 at 1730 (probably), Ishizuchi mountain, to the top of which Chisaku, John, and the Komoda brothers hiked the day before. Water from those mountains flows down through Saijo to the (inland) sea, and emerges in artesian springs even here (2170), at Kobosui (the little hut at the water’s edge). At the shrine there we encountered three local ladies enjoying an afternoon chat, and a running spring of very sweet water. Kobosui is named for Kobodaishi — Kukai — who founded just about everything of (religious) importance on Shikoku. Chisaku at 1830. Kuniko’s parents’ car at 5460. Hiroshi Komoda, and Kuniko, bracket the image. Kobosui, aka Teppojo (? ), interior.